Nature and contents of risk vary depending on how to recognize project life cycles (see P.145) and greatly differ according to contents of projects. 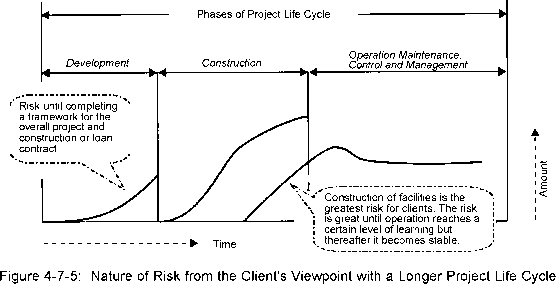 The risk in the life cycle of a project for ordering construction of facilities has natures as shown in Figure 4-7-4. Risk events and opportunity-bringing events at the beginning of a project will decrease as the project proceeds, but impact of risk events (damages caused by the occurrence of risk) will increase as the project comes near termination (completion, delivery). In other words, a planning stage is a "period with many risk events" and a stage of completion or delivery is a "period with great impact." 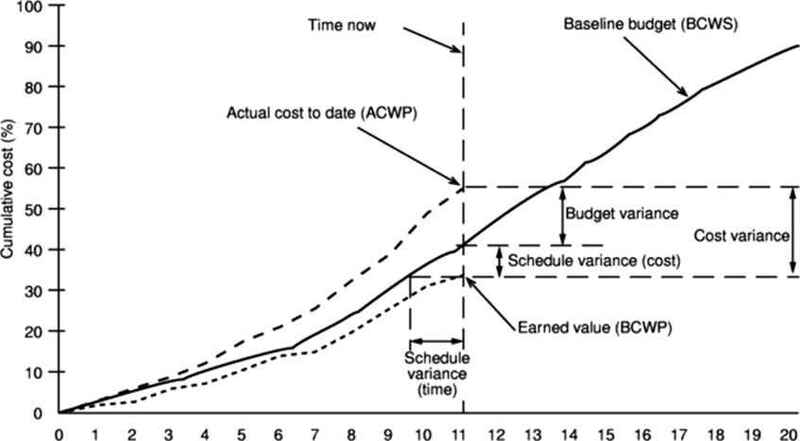 If countermeasures against immature portions in planning a project or setting up its requirements are found insufficient as a result of evaluation that is made at an initial stage of a project based on risk management including risk specification and quantification, it will be easily understood that the impact from the occurrence of a problem will become greater as the project proceeds. In the case of ordered projects, it is characteristic that total risk amount (theoretically, total direct and indirect expenses that will be needed when a project is interrupted or is not delivered as scheduled) and a possibility to bring opportunity (bonus, incentive, increase of added values through ingenuity and device) are defined through contracts or other, and relevant risks are examined at an initial stage. Note: The above figure shows a project life cycle consisting of several phases and the status of risks during a period from the start of the project with RFP (Request for Proposal) as development of them, until its termination with delivery. When a development project to develop, produce, and sell products is considered as one project, natures and contents of risks are different in each phase of the project's life cycle consisting of product development, production and selling. In the development phase, risks have a great theoretical value but the majority of actual risks is comprised of resources mobilized (such as human resource and funds) and this increases step by step with the lapse of time. On the other hand, technical development and facility construction to manufacture products being developed are started in consideration of the level of product development, and become considerably different from components and contents of risk events. The stage to sell produced products has also a different phase, so new risk elements will appear such as market risk and interruption of supply of raw materials. In projects to develop and manufacture products, total risk is the sum of absolute quantity of mobilized resources (human resources and funds) and direct / indirect expenses in the case of accumulation or interruption. This constitutes the impact of risk events but is premised on the acquisition of an opportunity that exceeds such impact as expected profit from product sales. Meanwhile, when construction projects are seen from the standpoint of clients, projects are considered to have a longer life cycle and a series of activities such as development, construction, operation and management is recognized as a project (e.g., in the case of business right contract such as PFI and BOT, the whole contract period including an operation period is included in the project). In this case, natures and contents of risks and their impact changes in each phase of the project life cycle. Figure 4-7-5 shows the nature of risk when a project life cycle is comprised of multiple and different phases. For clients, risk is comprised of a phase where loan or construction agreement is concluded at a development stage and a framework to realize the case is formulated. Note: The phase in Figure 4-7-4 is based on the development cf the same risk events (homogeneity of risk events). The above figure 4-7-5 is comprised of risks different by phase (heterogeneity of risk events). In this case, total risk shows the integration value of the whole and each phase could overlap in part as layer during a certain period. Since the size of risk events is different depending on projects, the above figure 4-7-5 only shows a conceptualized image. The impact of risk events increases through the construction phase, then decreased and becomes stable in the operation phase. (Similarly, for clients, the greatest risk element lies until their assets are surely built and the framework of the project is realized.) On the contrary, opportunity for clients means increase in profit in the operation phase, which depends on the quantity of funds needed for development or construction and the quality of operation and management. It is characteristic of a broader scope and width for determining opportunity. Generally, in the case of development projects (development-type products to develop new products, or build a framework of the whole project such as project finance), uncertainty is high and theoretical value of risk is great at an initial stage. However, development is actually, advanced by managing resources (human resources, funds) mobilized for development, making phased mobilization into projects, and monitoring the extent of project actualization. Specification and analysis/evaluation of risks and countermeasures against risks should be examined step by step on trial and error basis. This is because actualization is planned in the process of development. However, considering a prolonged project life cycle, there is no change in the basic concept that countermeasures against risks are prepared at an initial stage of projects.